A warm sound from a powerful single-unit set-up for the singer-songwriter. No facility for an effects footswitch. In 2017 Vox celebrated 60 years of industry prominence serving the good, the bad and the ugly: from Brian May to Paul McCartney and Elvis Costello. Vox started the year in Anaheim, at NAMM 2017, where the MV50 heads pipped all other amplifiers to the post, winning in the Amps category. This was the first time the world saw Nutube technology, a system developed by Korg which can now be found in Vox’s most recent release - the VX50AG. 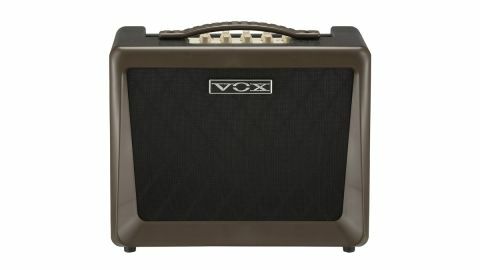 As part of a new series of three amps - VX - these amps all come with 50 watts of power and an 8” speaker. There’s one model for the bass guitar and one for the piano. The one we’re trialing is the acoustic guitar option. The box it comes in is light. We initially wonder whether the amplifier might have been accidentally left at the factory. But with the padding debris aside, the amplifier is indeed there, and it is featherweight compared to the average acoustic guitar and hard case combined weight (it’s actually 4.1kg). A reason for this is the Nutube technology consisting of: an analogue pre-amp circuit; a low-voltage vacuum tube, which works in the same way as a triode vacuum tube, and low power - all of which allows the amp to fit into a smaller package. A 40-minute round trip to my local guitar store on-foot, with a broken toe and the amp in tow, was reassuringly uneventful and the amp wasn’t an impedance. At times we even forgot we were carrying it. This VX50AG is certainly something for musicians who need to travel. The colour of the main body is a flecked black single piece of ABS polymer. The colour of the front of the amplifier, surrounding the cover over the speaker, is a little questionable - a hue somewhere between marshwiggle mud and green olives. It’s trying to be high-quality but this is possibly the one, and only one, truly disappointing feature of the amp, and it’s hardly noticeable on a dark stage. The bass guitar equivalent is a solid all-round black, revealing a sultry red beneath the cover of the front; the piano version has a tuxedo black and white colour palette. So it’s a bit disappointing the way the acoustic model turned out. The speaker itself is a two-way coaxial one (with a tweeter) for a wide frequency response - which means it can capture both the highs and the lows of your performance, technically and emotionally. There’s a bass reflex structure at play too in order to deliver a rich, low-frequency sound. The ABS polymer chassis, as well as obviously being lightweight, provides acoustic properties, which aid in producing this sound (and these are sounds which are pretty much unattainable from your standard wooden cabinets). There’s no hidden compartment for storing the power cables, so you will have to store them the proper way. The panel has a very simple set-up. Two main inputs - one instrument jack with bass, middle and treble EQ, and a mic jack with pretty much the same controls. The only difference is that the instrument line has an effects knob, so we’re unable to tell what our voice sounds like with a chorus effect, but the vocal line does have reverb, but no mid-range frequency knob. The sound this amp produces is generally extremely accurate. There’s no hiding the sticky fingers, slide, buzz or tap - all guitar-playing nuances are there, so this model probably isn’t for newbie beginners who need a glossy finish to their sound. Practising with this amp would probably be a good idea, if you need to polish your playing. On the other hand a clean run of scales makes you sound like a pro. Taking the amp through its paces we test it first with our nylon-stringed guitar. Leaving the controls on the guitar preamp flat the resultant sound is also pretty flat so we have to turn the bass and treble up to get the most accurate/pleasing to the ear tone. The chorus effect comes across a little strangely on the nylon-stringed guitar, particularly with fingerstyle playing, but some subtle chordal riffs, while muting the strings with the right hand makes for some pretty sweet tones. Dialling up to the reverb effects, you have to turn the effect knob up manually. A nice addition might have been the ability to use a footswitch with the effects. The reverb is, as expected, a reverb effect. There’s a very slight, hardly distinct digital vibe to it, which detracts somewhat from the general warmth of the sound. The third effect is a combination of the two. Combined with vocals on the other channel it’s very easy to adjust the overall volume, as well as the balance between voice and instrument. The bass and treble EQ are quite sufficient to make our voice and guitar sound as harmonious as they can be. We can even bust a gut in our apartment without shocking the neighbours (when using the amp to add an extra layer of depth to the sound, rather than as a means to reach a new audience up on the fourth floor). With an acoustic steel-stringed instrument the amp makes an equally clear, if not cleaner, sound. The EQ mix changes slightly: the guitar comes down a couple of notches and the bass frequency in the voice comes up. There’s still a good, clear balance and the projection is crisp. The tonal resonance is emphasized further by Vox’s use of wooden baffling. The mic line has a phantom power switch so vocalists can use condenser mics, though mine is an industry standard SM58. An integral phase switch is included on the amp too. This counteracts low-frequency range interference (or, more colloquially, it’s designed to eliminate feedback from the mic jack). In practice, we have no need of this and the phase switch is left to its own devices. Red clipping indicator lights illuminate, like evil eyes, in the volume control for each line. This is a useful indication that you need to turn the volume down, or distorted sounds are present. The power LED is a refreshing bright blue. A small rectangular grid of holes by the master volume also emit the same cool blue. Another useful function the VX50AG has (for a person such as myself juggling work commitments with the whims of a two-year-old, whose requirements may force me to leave my workstation unattended for a few hours) is an auto power-off. If left without any operation for four hours, it’ll switch itself off. To get it going again, just turn it on again. The line-out will feed your sound directly to a PA system, so there’s no need to be limited by the size (and weight) of this amp. At the same time there is a headphone jack, so the amp need never go further than your bedroom, though having spent a bit of time with the amplifier we’d recommend taking it further afield. In a bedroom environment it does produce a bit of a hum, so using headphones when playing is probably your best bet to reduce the grey noise. At £229 (inc. VAT) the VX50AG is at a very respectable mid-low range budget. It’s a simple design with the silver Vox logo stamped to the front of each model. This amp does need hands-on attention during performance particularly with the effects but it’s the perfect single-unit set-up and the aux in function allows you to mix backing music into your performance. If you’re in the market for something like this, it’s definitely one to try out... Go on, you know you want to.